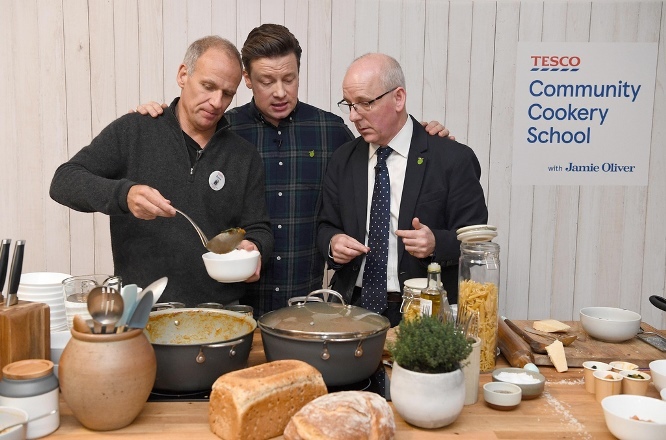 UK retailer Tesco has announced a new training programme ‘Tesco Community Cookery School with Jamie Oliver’, which will teach over 1,000 community cooks on how best to use surplus food donations to help stop good food going to waste. Celebrity Chef and campaigner Jamie Oliver launches a new programme with Tesco. Tesco and Jamie Oliver launched the Tesco Community Cookery School with Jamie Oliver at the Goodinge Community Centre in London, one of the community kitchens putting these food donations to good use, on Thursday 24 January. The programme will then roll out across the UK throughout the year.